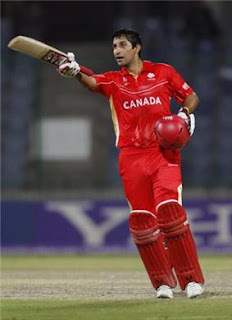 Today On Monday 7th March 2011 One World Cup 2011 match is taking place between two small teams of Group A Canada and Kenya in Delhi India. Its 23rd Match of World Cup. Kenya and Canada are two small teams which have not won any match in World Cup Yet but today one of them is going to win their World Cup match as they are facing each other. Kenya has won the toss and elected to bat first. Current score of Kenya is 57 for loss of 5 wickets in 13.5 overs. Canada has better players as compare to Kenya and its bowlers has also done a good start of the match by getting 5 wickets by giving just 57 runs.